Rick Sasso, M.D., is a founding member, and the president of Indiana Spine Group. He is a board-certified orthopaedic surgeon, specializing in spine surgery. Additionally, he is a professor and chief of spine surgery at the Indiana University School of Medicine, Department of Orthopaedic Surgery. 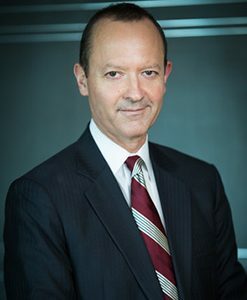 Dr. Sasso has dedicated his medical career to the comprehensive treatment and surgery of spinal disorders and abnormalities and is actively involved in spine surgery research including the research and development of spinal implants and techniques of minimally invasive spine surgery, as well as the development of instrumentation technology used to treat spinal disorders. Rick C. Sasso MD, was a co-author in a multi-institutional case series regarding treatment of cervical spine complications. 21 high-volume North American centers were selected for their excellence in cervical spine care and clinical research infrastructure and experience. The article was published in this month’s issue of Global Spine Journal. Ghobrial GM, Harrop JS, Sasso RC, Tannoury CA, Tannoury T, Smith ZA, Hsu WK, Arnold PM, Fehlings MG, Mroz TE, DeGiacomo AF, Jobse BC, Rahman RK, Thompson SE, Riew KD: Anterior cervical infection: Presentation and incidence of an uncommon postoperative complication. Global Spine J 7: 12S-16S, 2017. Rick Sasso, MD, was a co-author in a multicenter study, evaluating the incidence and treatment of Cervical dural tears. It was published in the Global Spine Journal. O’Neil KR, Fehlings MG, Mroz TE, Smith ZA, Hsu WK, Kanter AS, Steinmetz MP, Arnold PM, Mummaneni PV, Chou D, Nassr A, Qureshi SA, Cho SK, Baird EO, Smith JS, Shaffrey C, Tannoury CA, Tannoury T, Gokaslan ZL, Gum JL, Hart RA, Isaacs RE, Sasso RC, Bumpass DB, Bydon M, Corriveau M, DeGiacomo AF, Derakhshan A, Jobse BC, Lubelski D, Lee S, Massicotte EM, Pace JR, Smith GA, Than KD, Riew KD: A Multicenter study of the presentation, treatment, and outcomes of cervical dural tears. Global Spine J 7: 58S-63S, 2017. Dr. Rick Sasso served as a faculty member for the Scoliosis Research Society annual meeting held in Philadelphia: “Sagittal alignment-Goals, Planning and Pathologies” and lectured on, “Sagittal Deformity in the Cervical Spine-Etiologies and Presentations. Surgical Planning”. Thompson SE, Smith ZA, Hsu WK, Nassr A, Mroz TE, Fish DE, Wang JC, Fehlings MG, Tannoury CA, Tannoury T, Tortolani PJ, Traynelis VC, Gokaslan Z, Hilibrand AS, Isaacs RE, Mummaneni PV, Chou D, Qureshi SA, Cho SK, Baird EO, Sasso RC, Arnold PM, Buser Z, Bydon M, Clarke MJ, DeGiacomo AF, Derakhshan A, Jobse B, Lord EL, Lubelski D, Massicotte EM, Steinmetz MP, Smith GA, Pace J, Corriveau M, Lee S, Cha PI, Chatterjee D, Gee EL, Mayer EN, McBride OJ, Roe AK, Yanez MY, Stroh DA, Than KD, Riew KD: C5 Palsy after cervical spine surgery: A multicenter retrospective review of 59 cases. Global Spine J 7: 64S-70S, 2017. Fehlings MG, Kopjar B, Ibrahim A, Tetreault LA, Arnold PM, Defino H, Kale SS, Yoon ST, Barbagallo GM, Bartels RHM, Zhou Q, Vaccaro AR, Zileli M, Tan G, Yukawa Y, Brodke DS, Shaffrey CI, de Moraes OS, Woodard EJ, Scerrati M, Tanaka M, Toyone T, Sasso RC, Janssen ME, Gokaslan ZL, Alvarado M, Bolger C, Bono CM, Dekutoski MB: Geographical variations in clinical presentation and outcomes of decompressive surgery in patients with symptomatic degenerative cervical myelopathy: analysis of a prospective, international multicenter cohort study of 757 patients. Spine J 17: S1529, 2017. Rick C. Sasso, MD, was a co-author in a prospective, randomized, multi-center study evaluating bone graft substitutes for Anterior Cervical Fusion procedures. The article was released in the Journal Neurosurgery. Arnold PM, Sasso RC, Janssen ME, Fehlings MG, Heary RF, Vaccaro AR, Kopjar B: i-Factor bone graft vs Autograft in anterior cervical discectomy and fusion: 2-year follow-up of the randomized single-blinded food and drug administration investigational device exemption study. Neurosurgery 10: 1093, 2017. Dr. Rick Sasso returned from the annual meeting of the Cervical Spine Research Society-the premier and world-recognized leading society for the diagnosis and treatment of cervical spine disorders, wherein he taught in the Instructional Course and gave the lecture on-Posterior cervical deformity correction case: Surgical strategy and also presented the video demonstration in the session: Master surgical techniques, Tips and Pearls: Dr. Sasso taught “Cervical disc replacement”. Dr. Sasso was also asked to give the lecture: Tips and Pearls for Cervical Spine Surgeons Symposium: Restoration of lordosis after multilevel laminectomy for myelopathy and was elected as Vice President of the Cervical Spine Research Society at this annual meeting.